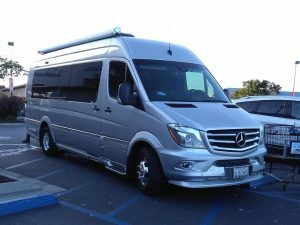 Morro Bay, CA – Well, yesterday at Albertsons supermarket I spotted a super-duper RV. And what marvelous memories it sparked. RVs are common in this scenic tourist mecca. I see them every day. But gosh, this baby was fabulous! Look how sleek and beautiful! beauty. It was parked. Whoever’s RV this was was shopping in Albertsons. I made an abrupt halt. It had an aerodynamic look. Just missing the wings, that’s all. A beautiful sculptured body, sheathed in gleaming aluminum. Not a scratch anywhere. Sculptured is the right word. Look at my photos. The long window on each side made it look longer and sleeker. I walked all around it. It looked brand new right out of the dealer’s showroom. By the time I got to the rear of it, I had a hunch. Could this be? I spotted its make. Yep, this was an Airstream. My hunch was right. And it had a California plate, which looked brand new, too. Back at the front, glancing up at the windshield hoping to peek at the inside, I saw a handicap placard hanging. Well, I have a handicap card, too. Lucky me. He too must be an old guy. But his wallet was certainly a lot fatter than mine. Strange though. Every Airstream I’ve ever seen has been a trailer, and I’ve seen many. They are special to me, as you’ll see. This was not a trailer. It was an RV. 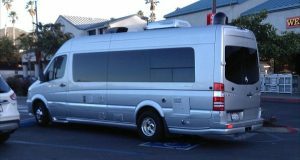 A Mercedes RV! That make, Airstream, invoked Wally Byam. He was the creator of the Airstream. That was way back before World War II. Wally Byam designed and built and sold them. Many makers were building trailers back then. More and better highways. Gas was cheap. More people could afford one. But he made the Airstream the best. It was THE trailer to aspire to. Wally Byam was also a marketing whiz. He got the brilliant idea of organizing owners into his Airstream Club. And he would lead them on caravans. His big car and Airstream were at the very front. Long caravans, lasting weeks, with two or three dozen rigs, even more. Across the United States. Through Europe. Once even thousands of miles through undeveloped Africa. Those Wally Byam caravans were played up in magazines and newsreels. What a buzz they created. My memories raced back to the 1960’s. And right then and there I decided to take pictures of this beauty and did that. And blog about it. Because way back in the 1960’s I dreamed of owning an Airstream. I felt you’d be interested. I waited. The owner didn’t come out. I hoped to chat with him and his missus. He wouldn’t be traveling alone. So I continued pedaling up and around. Somehow I missed them. When I circled back, I saw the Airstream driving off. Darn! Yes, way back then I was hot for an Airstream. I was 33. I was a journalist at the Worcester Telegram-Gazette in Massachusetts. A staff writer on that metro paper’s Sunday magazine. One day after work I stopped at Charlie Glowick’s gas station to tank up. He was pumping, of course. That’s how it was back then. I spotted something I had never seen at the far side of his lot. It was a tent set up on what looked like a utility trailer. The trailer had an extension flaring out about 20 inches on each side. But we had little Arthur and Monique. “You get them ready. I want you to see this before Charlie Glowick closes! I’ll clear the table.” She had no idea what I was talking about. He was still open. He showed us everything. How the drawer on each side was really a double bed. How the drawers slid and locked into place. How there was storage space under the beds. How the whole thing folded down. We had a four-door sedan. He said that would work out fine. I was eager to say yes. I looked at Pauline. I saw her thinking. And thinking. We knew peanuts about camping. Had no equipment. And little Arthur and little Monique—she was barely out of diapers! I waited. Pauline still didn’t speak. Finally! “Okay, John. We’re just renting. Not buying. Right?” I nodded. I had a week of vacation coming up in two weeks. “I’ll put you down for that,” Charlie said. “You’ll have a great time. Make sure and take pictures!” I gave him a deposit. Forthose two weeks we talked over where to go. Made lists of what to take. We were on a budget. Didn’t want to go out and buy stuff. We did have a camp stove and ice cooler. We’d just borrow stuff from home. I did go to Sears and bought an 8 mm. movie camera for $24.95, I think it was. Expensive. All new to me. And we set off for Shenandoah National Park in Virginia, 400 miles away or so. In the Blue Ridge Mountains. About a third of the way there, we pitched camp in Squantz Pond State Park in Connecticut $3 for the night, I believe. It was getting dark out. It had trailer spots, each with a plank picnic table and stone fireplace. A busy place with people camping at just about every spot. A water spigot nearby. A washroom with toilets 500 feet away. Quite clean. Set up the trailer, Simple supper. Took a while to ready Arthur and Monique for bed. We were tired. Well, I slept with Arthur at my side and Pauline with Monique. Yes, it took some adjusting. Up early, I went out to get breakfast going. I had my office leather shoes on. The grass was wet. I had never experienced dew. My poor shoes. We had a lot to learn…. Ready to go, we took a ride around to look at the park. Beautiful. Well maintained. The pond itself was beautiful. Ponds are small. This was big! For a minute I thought we should stay right here. (Do Google Squantz Pond State Park. Or Bing it.) We could have a great week right here. Didn’t bring it up. On we went. We made Shenandoah National Park by the next night. Our very first national park to visit. So beautiful. So interesting. What a good choice. Fine weather. Much to see, including picturesque little towns. The kids were sweet. No problems. Lots of fun. Lots of togetherness. Pauline got into it as much as I did. My little movie turned out to be a good idea. It did capture lots of nice memories. A fine week. By the time we got home, we knew we’d like to do more camping, and with a tent trailer. Charlie Glowick had steered me right. But we’d have to wait. A tent trailer of our own was out of reach. Well, it so happened we did acquire one. We had a Sears Roebuck Catalog. Remember its famous catalogs? They came out every year. Plus smaller seasonal ones? We were Sears catalog customers. Well, they had a tent trailer for sale. Obviously a Nimrod but with their own name on it. It was meticulous described. All the dimensions, quality of the tent, how it folded, on and on. Very tempting. But too expensive. With all those precise dimensions from the catalog right at hand, I decided to build one. I was a journalist. My tool skills were laughable. But I was so eager. I remembered Fred Walsh nearby. A retired school shop teacher. (Do we still have shop teachers?) Mr. Walsh was very handy and had lots of tools. I showed him the picture from the catalog and explained what I wanted to do. Finally he agreed to help me. I went to an auto junkyard and told the owner what I was looking for. He showed the rear end axle of a junk car. He said he could take that and weld a simple frame on it out of angle iron. To the exact Sears dimensions I showed him. His price sounded good. I said yes and he did it. Included a tow bar, of course. We did the rest in Mr. Walsh’s backyard. He did all the smart stuff and I all the dumb stuff. He did the major stuff alone during the day. It was summer and I’d rush and go work on it after supper. It all went quite well. The plywood drawers slid in and out fine. We sheathed the body with shiny aluminum. Beautiful! He was pleased with it. I was proud of it. All possible because of him. But now I needed the tent and poles for it. So I contacted Sears and ordered a tent like the one on the trailer in their catalog. I told them a long one. I said I needed a replacement tent, along with the tent poles. Okay, they said, but send us the serial number on your trailer. But, if you think about it, Sears got to sell a tent and poles it would not have sold otherwise. And I learned a thing or two. Well, my hand-made rig, with all the stuff I had to buy and the check I wrote out for Mr. Walsh, turned out nearly as expensive as the Sears model! Oh, well. But we were so excited about adventures coming up! Along with little Arthur and Monique. Never possible until this. We did a lot of weekend camping. We’d leave right after work on Friday and head for a great weekend. At a state park on Cape Cod. $2 a night. Or another in Rhode Island—Burlingame, very fine—for seashore splashing in the salt water, then swimming the salt off in Burlingame’s pretty lake. We loved it. So did our little two. We’d cook supper on our camp stove and dine on a park picnic table at our site. Toast a few marshmallows. Fun. Togetherness. Affordable. We did so much of it and in so many places and my enthusiasm continued so high that n time, I started writing a column for the Telegram. It was called “Camps & Camping.” It ran every week in the Sunday edition. It was an add-on to my regular job for a bit of extra money. I did it just as much for the fun of it. No exaggeration now. I wrote it for 10 years without missing a Sunday. Once I wrote it from my hospital bed when I got laid up. I developed lots of regular readers. Amazing how family camping was catching on! Now fast forward. I’d been promoted to staff writer on the Sunday Telegram’s own magazine, Feature Parade. To me, it was the best writing job at the Telegram. I got two weeks’ vacation a year. I asked Fred Rushton, our editor, for four weeks off—six in all. The extra four would be without pay. “No, no.” I told him I wanted to take Pauline and the kids on a six-week round-trip to California. She was teaching school. That would work. My dream trip! And I’d write stories about it for Feature Parade. And he could pay me for them at the mag’s standard free-lance rate. He hemmed and hawed, then said okay. We did it—11,000 miles all the way to California and back. Wonderful! A few things went bad, but we made it home safe, sound, and pleased. And of course we used our home-made tent trailer. But I got a new Falcon station wagon. I set up the back seat as a play yard for our two kids. And off we went. Along the way, I mailed Fred half a dozen major Sunday features with photos, every feature with a central Massachusetts peg. I had a small Olivetti portable. I loved it. I’d set it up at our campsite and type away. When we got back, I also wrote 22 columns with photos about national parks we had explored. Those ran in our Sunday Travel Section. I produced them at home all while carrying on my regular Feature Parade work. I was a busy boy. In time, on the side, I wrote a book on all this. It was a memoir about our family camping experiences. Some Telegram pals I showed it to thought it was great. But I never got to sell it. My mistake was that I sent it to major book publishers. The biggest in the business. The rejection slips hurt. Thinking back now, I should have sent it to a niche publisher. Live and learn. Many road trip adventures followed. With Arthur and Monique, and then little Mark, our third. But In time, sad to say, Pauline and I split. Over the years, many trips. I retired. I switched from the tent trailer to RV’s. So this was camping quite different. It was RVing. Camping on four wheels. My first RV was the fabled, fabulous little VW Westfalia. A used one. The first and best of its genre. The one that turned legions of folks into RVing. I had long given up on ever owning an Airstream. The Westfalia was tiny, but I’d be traveling solo. Well, in it I explored much of our USA. Wrote many free-lance pieces as an ongoing series for the Worcester Sunday Telegram. I laughed. “Thank you, Brian. You say the longest! But for sure the best, too, right?” He laughed, too. He didn’t dare disagree. I wore that Westfalia out, then bought another. Criss-crossed not only through our 48 states. In two-long summer trips, I traveled 15,000 miles all through Mexico. From its border right down to the bottom. From Mazatlan on the Pacific Coast to Tampico on the Gulf of Mexico. I ran into so many interesting people. A few things went sour, of course, but what great travels. Articles about all those got to be published here or there. My latest big trip was four years ago. By this time I was driving a Ford E-Van. I had converted into a one-person camper. I was then living here in California — six months here, six back back home in Connecticut. It was time to head back. It would be a 3,000-mile ride on the Interstates. If I drove 300 miles a day, I’d get home in 10 days. Fairly easy. But I wanted to go slow and see a lot. I totaled 5,273 miles and it took me 101 days. A fantastic finale to my roving days. I’ve locked in a ton of memories with all the articles and columns and blogs I’ve pounded out about all that and other topics over the years. Which brings me right back to Wally Byam and his beautiful Airstreams. And the fabulous Airstream RV I spotted in the Albertsons parking lot. If only Wally could see it! How pleased he would be to see Airstreams till leading the pack. How he would applaud this model’s comfort and luxury. I did go online and check out that model, the Interstate. Its price was $176,000. And now add on the sales tax and the insurance. How about that?! I hope that well-off old retiree and his lady get to use it for more than just a weekend or two at places like Squantz Pond State Park. They should do our whole 48, plus Alaska! Well, my dream of owning an Airstream remained just that, a dream. But what wonderful family camping and RVing I’ve gotten to enjoy! Over so many years … so many decades! These days I’m so happy just pedaling around on my little trike. It’s nice and warm and sunny out now. So I’m going to break and enjoy lunch and then take a spin on it. My first stop, the public library. And who knows, maybe I’ll spot something interesting at Albertsons. As you know, I welcome your comments, good and not so good. I read them all. It’s my big pleasure these days in doing this. Send one now. Johnguylaplante@yahoo.com or @gmail.